Planning a cross-country bike tour? 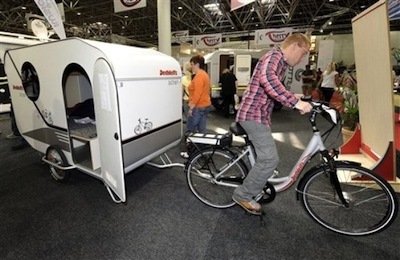 Considering self-contained with panniers, doing it credit card style at hotels, or this! Photo: AP via Daylife, from Caravan Salon fair in Duesseldorf, Germany. So it’s attached to a electric assist comfort bike and you could cover the top of the camper with solar panels to generate electricty. 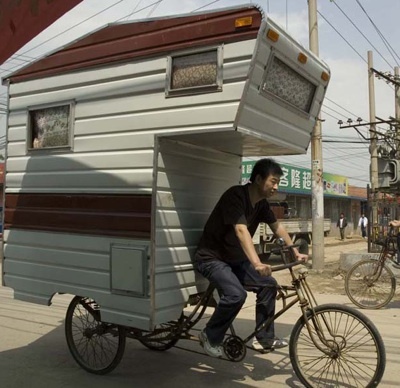 It’s a Digital Bike Nomad’s hotel at SXSW or a Cargonista’s dream vacation. Even a place to stay warm at a cross race. Likely influenced by the Kevin Cyr concept from last year.